If you are certified we offer 1 dive per day, 2 dives per day, or even 3 dives per day. 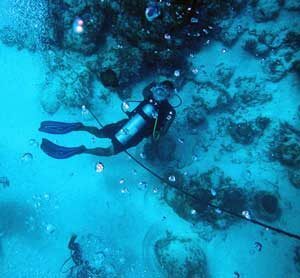 We also offer dive packages for multiples days of diving also and night dive to the Marine Reserve. Beginners, first dive ever! this is carried out after you review the first chapter of the open water dive manual or watching to video. 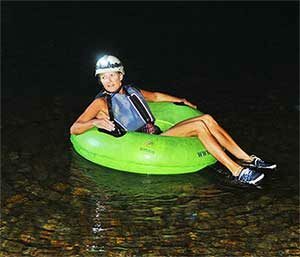 You are with your instructor as you start at 4′ and base on you comfort you explore the under water whorl up to 30′ in dept. 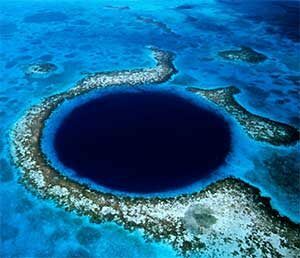 The “Blue Hole” is located in the center of the lighthouse reef Atol, Which is about fifty miles due east of Belize City. Originally a cave, the roof fell in some 10,000 years ago as the land receded into the sea. Go on board our large dive boat with cabin, head and fresh water shower, relaxed seating and easy access in and out of the water. As we head towards your most memorable day where you can enjoy a continental breakfast, sunrise and fresh morning air. The Great Blue Hole, discovered by local fishermen and Later explored by Jacques Cousteau in the 1970’s will be your first dive into the deep blue to a max depth of 130 feet. You will explore the greatness of stalactites and stalagmites. Greet bull and reef sharks gliding over the Blue Hole and swiftly plunging into the abyss. A different world awaits you not far at Halfmoon Caye Wall, the site of the second dive. Midnight parrotfish,garden eels Southern and Eagle Rays greet you at the start of the dive and lead you towards swim through into the abyss towards sweeping gorgonians, and an array of large sponges. A succulent picnic Lunch will be served on shore at Half moon Caye, following a stroll to the red footed Booby Bird Sanctuary.A one of a kind experience where from a treetop observation tower you can marvel at the cotton like creatures and also the majestic Frigate Birds. Either, the Aquarium , Silver Caves, Black Beauty or Eagle Ray Wall will be your last dive for the day. Whichever it is, it is sure to close off the day magnificently. 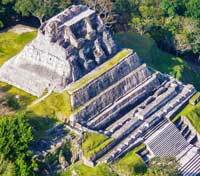 Altun Ha is located 31 miles north of Belize City on the Old Northern Highway. A two-mile dirt road connects the main road to the site. The area around the Altun Ha is rich in wildlife including armadillos, bats, squirrels, agouti, paca, foxes, raccoons, coati, tyra, tapir and the white-tailed deer. Two hundred species of birds have been recorded and there are large crocodiles that inhabit the Maya-made water reservoir. 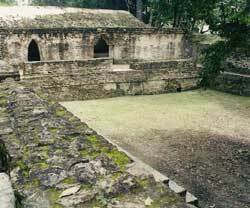 Your day to Altun Ha begins at 5:45 am with pick up at your resort. We then have breakfast in San Pedro town, and then take either a 6:30 water taxi to Belize City which is an Hour and an half ride or a 7 am flight to Belize City which is a 15 minutes flight. 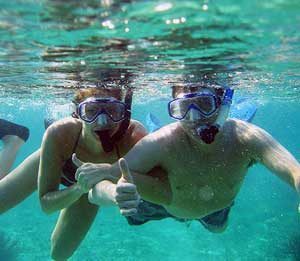 In Belize City you will be picked up by your Professional guides. 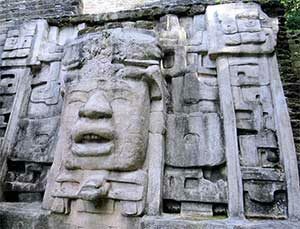 Your guide will take you on a 1 hour drive to the Maya City of Altun Ha. (first half of your hour will be on the Phillip Goldson Highway then you head into the Old Northern Highway). 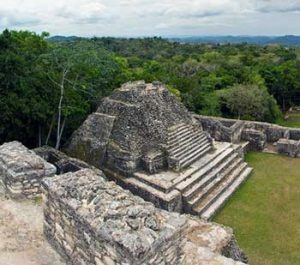 You will be driving beautiful Belizean villages until you arrive at the Maya Site. 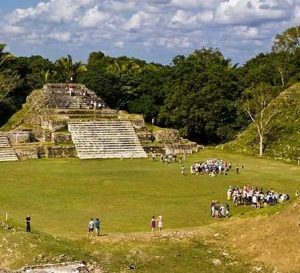 Your tour of the Ancient City will be led by your guide as you listen to the history of this site, the importance of each structure, and what caused the Mayans to flee their City. After the Maya Site tour comes lunch time! Enjoy your fresh cook Belizean lunch, rice and beans with stew chicken and vegetable salad. After lunch you hop back in your tour vehicle and drive back to Belize City. From Belize City you take your water taxi or flight back to San Pedro. In San Pedro you will be met by one of our representative who will insure that you have you transportation back to your resort. Light-weight comfortable clothing and shoes with a good grip, long trousers are more suitable than shorts as they give more protection from insects and weather, hat, sunscreen, and insect repellent. 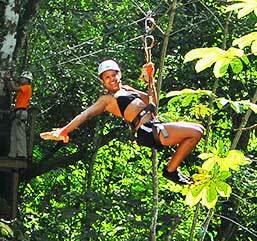 The day trip to Zip Lining begins at 5:45 am with pick up at your resort. We then have breakfast in San Pedro town, and then take either a 6:30 water taxi to Belize City which is an Hour and an half ride or a 7 am flight to Belize City which is a 15 minutes flight. In Belize City you will be picked up by your Professional guides. From Belize City to Jaguar Paw it’s a 1 hour and 15 minutes drive on the George Price High Way, then a nine miles drive into the rain forest up to the “food hills” of the Maya Mountains. On your drive you will enjoy the diversity of Belize’s culture and ecosystems as you will be driving through beautiful historical villages. Upon arriving at the Zip Lining Park, you take a 5 minutes’ walk to meet your guide. Your guide will then suit you up with your proper Zip Lining Gears as you zip from your first platform to complete 7 different platforms. After Zip Lining comes lunch time! Enjoy your fresh cook Belizean lunch, ( rice and beans with stew chicken and vegetable salad). After lunch you hop back in your tour vehicle and drive back to Belize City. From Belize City you take your water taxi or flight back to San Pedro. In San Pedro you will be met by one of our representative who will insure that you have you transportation back to your resort.